“Browse the internet like never before with Browse Camo” is the promise on the official Browse Camo website. This is an adware application that collects your browsing data and displays annoying ads in your web browser. If you do not like your exploration of the Internet being interrupted by banners, pop-ups, and coupons, removal of Browse Camo is your best option. Read on to find out more about it. Looking at the official Browse Camo website, we immediately see from its template that this application is one of many that were made by SuperWeb LLC. The only information provided on this page is not useful at all and contains spelling mistakes. That does not inspire any confidence in its capabilities. It is best to remove it at once upon discovery. Browse Camo is distributed via bundles of free programs. This means that you can never know if you got something else, which could be annoying, while installing this package. SuperWeb adware, like Beta Rez, Esuack, or Hold Page, is known to travel bundled with various programs, some of which could be dangerous. Even if all of them were harmless, some are certain to be at least somewhat annoying. You might have to remove not one but several of them, wasting your valuable time. A much better option is to download a powerful spyware scanner to find all threats and delete them in bulk. When installed, Browse Camo gets access to your web browser and begins tracking your Internet activity. It remembers the web sites you visited and the things you looked for on online shopping sites. Later, it uses this information to tailor the ads it displays according to your supposed hobbies and such. These ads are very annoying, so we recommend removing Browse Camo. If you find the ads provided by adware like Browse Camo interesting and click them, you should know that Super Web LLC will receive a small sum of money for the increased traffic to that website. Of course, you will not get reimbursed for your part in this. We do not find this fair at all. And, if that were not enough, some websites that ads by Browse Camo link to could contain actual threats to the security of your computer. By clicking ads displayed by adware, you risk your security to do a job that you will not get paid for. 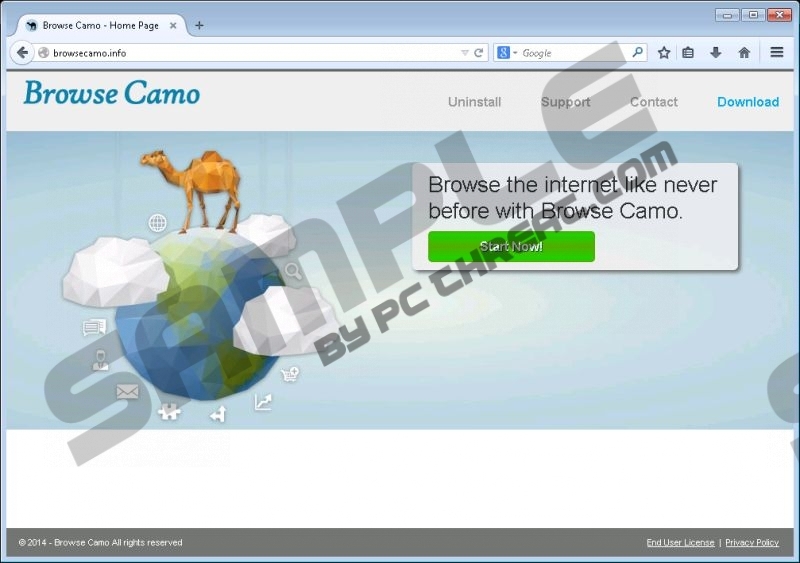 Uninstall Browse Camo to avoid this scheme. The simplest way to remove Browse Camo is to download a professional antispyware program, letting it scan your system and delete any threats. You can also uninstall Browse Camo manually. Be advised that other undesirable applications will remain. Nevertheless, the instructions are below. Right-click the bottom-left corner of your screen and go to Control Panel. Click Uninstall a program, select Browse Camo, and click Uninstall. Click the Windows button and go to Control Panel. Click Uninstall a program, right-click Browse Camo, and click Uninstall. Click Add or Remove Programs, remove Browse Camo. Quick & tested solution for Browse Camo removal.